The Clark School has established Virtus: A Living-Learning Community for Success in Engineering, which focuses on male engineering students. The initiative will promote community among first- and second-year engineering students and provide support for academic and professional success. 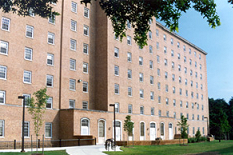 Participants in the program live together in Easton Hall and attend many of the same classes together. They take a one-credit seminar on career opportunities within the engineering field. The program is modeled after Flexus: the Dr. Marilyn Berman Pollans Women in Engineering Living and Learning Community for female engineering students. Virtus is part of the Successful Engineering Education and Development Support (SEEDS) Program funded through the National Science Foundation (DUE #0969232).